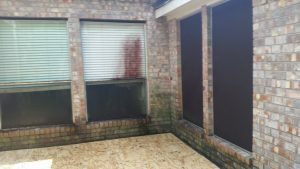 Homeowners in Fulshear want to find an easy and dependable way to keep their homes in the best shape possible without breaking the bank. There is no denying that all these ongoing maintenance essential to keep your home in top shape all year around. Some homeowners fail to keep the exterior of the house itself clean – which creates not only an eyesore but the potential for costly repairs down the road. Hiring the professionals at Pressure Washing America, LLC is a great way to save you from the potential expense and hassle of major exterior repairs. If you keep your home clean, you can prevent many expensive problems which can save you from repainting, brick repair, wood replacement, pool deck repairs – and more. 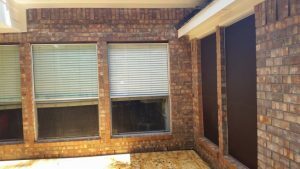 We can safely remove the dirt, mold and mildew which can help extend the life of your siding, stucco, fencing, decks and bricks. CAN MOLD AND MILDEW IMPACT MY HEALTH AND SAFETY? You may not be aware of it, but your home is also host to different contaminants such as algae, mold, mildew and dirt and these things build up and become a slip hazard and cause upper respiratory issues. Pressure washing not just cleans the surfaces around your home, but also helps prevent the growth of these things that may cause allergies and serious injuries from slipping and falling. Look at the black mold accumulating on the window below – think it is impacting the indoor air quality? The homeowners sure did! DO YOU CLEAN COMMERCIAL PROPERTIES? A clean exterior can help your commercial establishment make a good impression to your customers. A clean exterior can help people feel safe coming inside your church, warehouse, store or restaurant. Dirt, mold, chewing gum, mildew and other stains can make the wrong impressions about your business or property. Think about it – If you do not keep the outside clean, what does it say about what goes on inside? ANYONE CAN POWER WASH – RIGHT? The average “I can do it all” handyman cannot give you the same quality results as a professional power washing service with professional detergents and professional equipment. With Pressure Washing America, LLC you will always get the best service, the best clean – and you will work with a company you can trust. We have been in the industry since 2005 providing power washing services in Fulshear, TX. Our professionally trained power washing technicians use only the latest technology in pressure washing, window cleaning and roof cleaning. Contact us right now to get your free quote or if you have any questions at all about our services or our company!